If you’ve ever heard a squealing sound under your vehicle hood, chances are it was your serpentine belt. More importantly, the belt powers the alternator. The alternator creates electricity that’s used by your vehicle’s electrical systems and also charges your car battery. Without the alternator, the battery will go dead in a few miles. And, on most vehicles, the serpentine belt powers the water pump. The water pump circulates coolant through the engine to keep it within optimal operating temperatures. On some Greeley cars, the water pump is powered by the timing belt instead of the serpentine belt. When they understand what it does, Greeley drivers realize that if it breaks, it affects a lot of systems. That’s why vehicle manufacturers outline recommended replacement guidelines in the owner’s manuals. If this important maintenance component is not included in your owner’s manual, come see us at Advanced Auto Pros. At Advanced Auto Pros in Greeley, your professional technician can perform a visual inspection of the belt to see if it has any cracks that signal the belt could fail soon. If the belt has more than three or four cracks every inch, has deep cracks that penetrate half the depth of the belt, is frayed, is missing pieces or has a shiny glazed look, it needs to be replaced regardless of age or mileage. If it has lost a significant amount of thickness, it also needs to be replaced. Talk to your service advisor at Advanced Auto Pros. There’s a special spring-loaded pulley attached to the engine called the tensioner pulley. Its job is to make sure there’s a constant tension on the serpentine belt so that it doesn’t slip. The spring can become worn and no longer provide the necessary pressure to keep the belt tight. At Advanced Auto Pros, we recommend that the tensioner be replaced at the same time as the serpentine belt. As mentioned, a squealing sound could alert you that the serpentine belt needs to be replaced. It may be loose if you hear a slow, slapping sound when idling your vehicle. 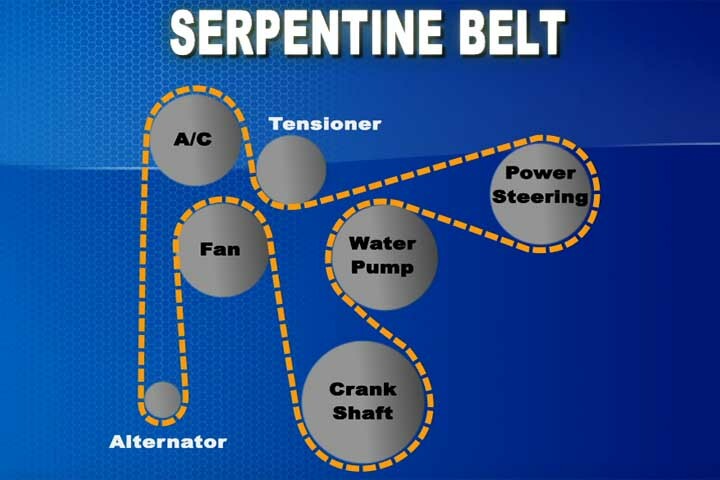 All in all, the serpentine belt is very important to the operation of your vehicle. And it’s not that expensive to replace at Advanced Auto Pros – so it’s good to do so before it fails.